Parishioners of the Dormition Church in the village of Vaslovitsy in Ukraine have been praying day and night for peace in Ukraine and the right to freely attend their church. The religious community of the UOC in the village of Vaslovitsy have offered continuous prayer for two weeks. 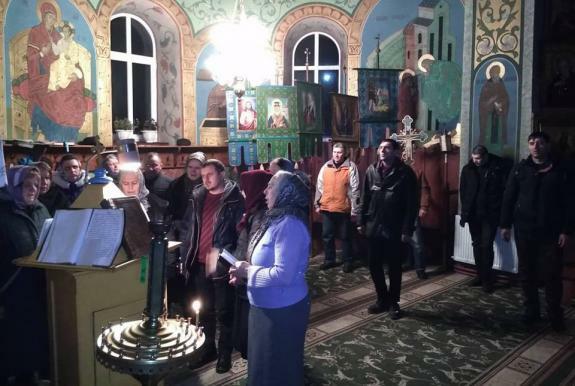 The faithful of the Dormition Church pray day and night for peace in Ukraine and in their hometown, and for the preservation of Orthodox faith in the Bukovina region, reports Foma.in.ua. The congregational prayer service began on January 27, 2019. On that day, two meetings were held in the village: the meeting of the territorial community, which voted for the transition of the parish of the Dormition Church to the schismatic “Orthodox Church of Ukraine”, and the meeting of the religious parish, which unanimously reaffirmed its loyalty to the Ukrainian Orthodox Church and His Beatitude Onufry, Metropolitan of Kiev and All Ukraine. The faithful informed the executive bodies of the local authority and the OSCE Monitoring Mission in the Chernivtsi region about their decision to preserve their confessional governance. Minutes of the parish meeting were published online. Although the meeting of the territorial community was illegal, the faithful were not sure that they would not lose their home church, therefore they began to pray for peace and the right to freely attend their church. The parishioners read the entire Psalter within a day. On Sunday, the reading stops for the celebration of the Liturgy. According to the parishioners, the congregational prayer service changed them. Fear, uncertainty, tears, and confusion from the fact that they were suddenly among the persecutors of the faith, were replaced by joy, love, and trust in God. The parishioners welcome everyone who wants to join in the collective prayer and thank the Lord for these special days of their lives. The chronicle of events is covered on the page of the Dormition Church of Vaslovitsy on Facebook.